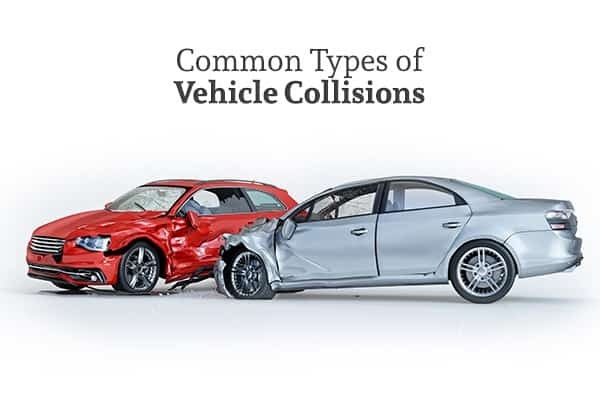 The Most Common Types of Vehicle Collisions | Branch & DhillonBranch & Dhillon, P.C. One of the most common types of auto accidents is a head-on collision, which often results in serious injuries such as whiplash and spinal cord injuries. These crashes often happen when one car spins around on ice, a driver runs a red light, or a driver does not pay attention in a parking lot. In addition to causing injuries, head-on collisions usually cause irreparable damage to the cars involved. A rear-end collision is another common type of car crash. This type of crash usually occurs on main roads when one or more driver is not paying proper attention to the traffic in front of them. Rear-end collisions can also occur when drivers follow the car in front of them too closely. Although rear-end collisions are not usually the most serious types of crashes, they can lead to injury or even death when vehicles are traveling at higher speeds. One of the most serious types of crashes is a T-bone accident, which usually occurs at intersections. In this type of crash, two cars are usually traveling in different directions. Both cars may be traveling in a continuous line, or one car may be turning against oncoming traffic. These types of collisions often occur when one driver misjudges distances, runs a stop sign, or runs a red light. Depending on the speed of both vehicles, these crashes can be very serious, often resulting in significant injuries, damage to the involved vehicles, and even fatalities. Not all car accidents involve two vehicles. In some cases, crashes occur with only one involved vehicle that is running off the road, turning too quickly, hydroplaning, or sliding on ice. These crashes can be very dangerous for the driver and any passengers involved. They are most common at higher speeds, and younger drivers with less experience are more likely to be involved. Follow all of the rules of the road. One of the best ways to avoid automobile accidents is to make sure that you are following traffic laws at all times. When you fail to follow traffic laws, you are more likely to be involved in a collision. Drive without distractions. Driving with distractions, such as texting or intense conversation, always raises your chances of being in an accident. Avoid engaging in any activity that will distract you while you are behind the wheel. Do not drive while fatigued. When you are tired, you cannot pay attention to the road as well as you can when you are well-rested. Being tired can also impair your judgment significantly. Avoid driving when you are too tired to be at your best. Do not drive while intoxicated. Intoxication impairs your judgment and slows your reaction time, making it much easier for you to make a mistake that ultimately leads to a crash. Never operate a vehicle while you are under the influence of alcohol, illicit drugs, or prescription drugs that are known to cause drowsiness or other forms of impairment. Exercise extra care in bad weather. When the weather is bad, accidents are more likely to occur. If you are driving in fog, rain, sleet, or snow, give yourself more time to get to your destination and exercise extra care while you drive. If you feel the weather is too dangerous, just stay where you are until conditions improve. Drive defensively. Other drivers may not always be as careful as they should be. Pay attention to other drivers on the road so you can react accordingly when someone disobeys a traffic law, swerves or engages in some other dangerous behavior. Even when you do everything right, you may still be the victim of a car crash. If you are injured in a car accident, you may be entitled to compensation. In order to recover this compensation, you need to work with an experienced personal injury attorney who understands these cases. Contact Branch & Dhillon, P.C. today to learn more or to schedule a consultation.